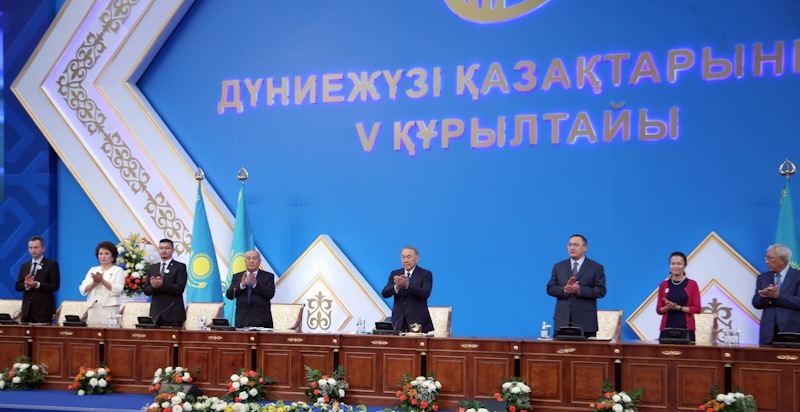 The opening ceremony of the 5th World Kurultai of Kazakhs with the participation of Head of State Nursultan Nazarbayev has kicked off at the Palace of Independence in Astana today, Kazinform reports. Over 800 delegates and guests from 39 countries of the world take part in the event. Those are scientists, teachers, businessmen, athletes, statesmen and mass media. Over 80% of delegates and guests take part in the Kurultai for the first time. For instance, delegates from Japan, South Korea, Italy, Ireland, Montenegro, Poland, Azerbaijan and Moldova attend the event for the first time ever. In attendance at the Eurasian Media Forum are deputy governor for social policy of the Tomsk Region Chingis Akatayev, head of Turatinskiy district of the Republic of Altai Amanzhol Sakharyanov, deputy of the legislative meeting of the Omsk region of the 6th convocation Nurlan Kartabayev, rector of the Institute of Regional Economy and Law Irlan Iskakov from Saint Petersburg, member of the Council of the People's Assembly of Kyrgyzstan Yerkin Bulekbayev, Vice President of the Agricultural Science Academy of Mongolia Agypar Bakei and many others. Dignitaries of the Kazakh ethno-cultural movement from Germany, France, Uzbekistan, and Russia are expected to participate in the Kurultai, namely Abdrakhman Cetin from Cologne, Abdulsamet Altai from Paris, Tashbulat Babazhanov from Tashkent, Sansengali Kuspanov from Saint Petersburg. Ministries for religious affairs and civil society, education and science, information and communications, culture and sports, healthcare will hold roundtables for foreign delegates. Delegates and guests of the Kurultai are also expected to attend Astana EXPO-2017, an ethno aul (village) and the Astana Opera and Ballet Theater.